Sturdy The Pokémon is protected against 1-hit KO attacks. One-hit KO moves do not work on this Pokemon. Sand Veil* Boosts the Pok�mon's evasion in a sandstorm. 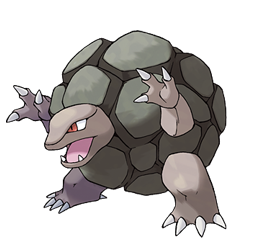 This Pokemon's Evasion rises one level during Sandstorm. immediately hard� ens and crumbles away. grooves have been dug into the sides of mountains to serve as guideways for diverting this POK�MON�s course. Leaf Green Its boulder-like body is extremely hard. It can easily withstand dynamite blasts without taking damage. Diamond/Pearl It tumbles down mountains, leaving grooves from peak to base. Stay clear of these grooves. Platinum Even dynamite can�t harm its hard, boulderlike body. It sheds its hide just once a year. Heart Gold It sheds its skin once a year. The discarded shell immediately hardens and crumbles away. Soul Silver It is capable of blowing itself up. It uses this explosive force to jump from mountain to mountain. White Even dynamite can't harm its hard, boulderlike body. It sheds its hide just once a year.